We have included some items of interest for you. 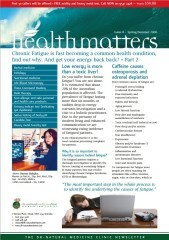 Check back here often at the Natural Medicine Clinic for the latest in natural health, alternative medicine, holistic medicine, alternative therapies, herbal medicine, natural healing, herbs, fitness, medicinal herbs, nutritional therapies, complementary therapies, longevity research, physical health, mental health, and spiritual health. Add this site to your bookmarks and check here regularly for news and updates! 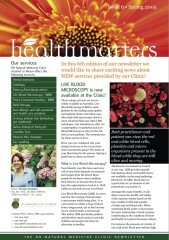 If you wish to receive the Newsletter via email regularly, please complete the subscription box to your right. 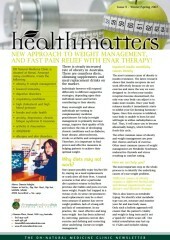 Download Winter/Spring 2007 (376kb – pdf)New approach to weight management,And fast pain relief with ENAR Therapy! 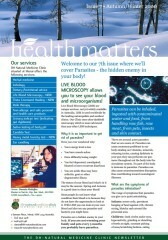 Download Autumn/Winter 2006 (600kb – pdf)Parasites – the hidden enemy in your body! LIVE BLOOD MICROSCOPY allows you to see your blood and microorganisms! How to prevent parasites infestation? Download Spring 2005(288kb – pdf)Exciting news about NEW services provided by our Clinic! – LIVE BLOOD MICROSCOPY is now available. Download Autumn 2005(668kb – pdf)Focus on the implication of body acidity on general health, the role of calcium as well as the treatment of skin disorders. 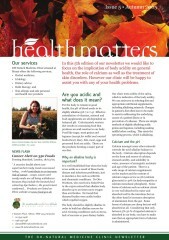 > Downlooad Autumn 2004 (pdf)Focus on the issue of anxiety, stress and depression.